How to Report Elder Abuse in Wisconsin | Hupy and Abraham, S.C. Your thoughts are keeping you up at night and overwhelming you during the day. On a recent visit to your loved one’s nursing home, you saw signs that your loved one or another resident was being abused. You want to help—you need to stop this from happening—but how can you do that? Contact the regional Wisconsin Department of Health Services Department of Quality Assurance (DQA) office which covers that nursing home. File an online complaint with the DQA. Call the DQA at 1-800-642-6552. Address your concerns directly with the manager or owner of the nursing home. Make plans to move your loved one to another facility as soon as possible. 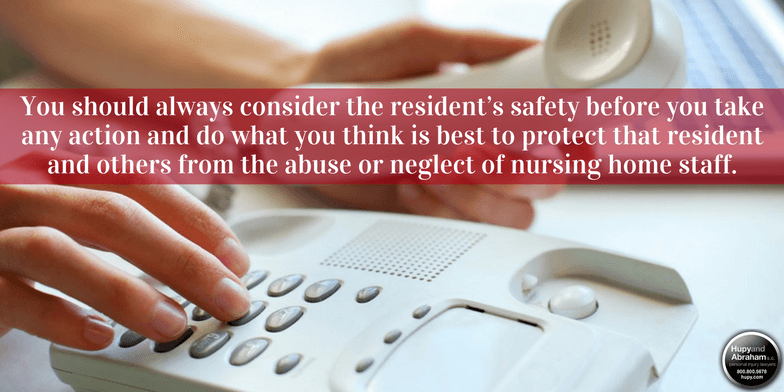 Of course, you should always consider the resident’s safety before you take any action and do what you think is best to protect that resident and others from the abuse or neglect of nursing home staff. The DQA will ask you information about your relationship with the person who is the subject of the complaint and about why you think the person is being abused, neglected, or otherwise hurt. It is important to provide as much specific information as you can so that a full investigation can be done and so that a fair determination can be made. It can be scary to know that a nursing home resident is being neglected or abused and to know that the resident may not be able to advocate for her own safety. It is up to you to take action. It is up to you to help keep that resident and others safe. Accordingly, if you suspect nursing home abuse then we encourage you to take one or more of the actions described above, and we invite you to share this article on Facebook or Twitter so that others will have the same tips and resources available if they suspect nursing home abuse.